Celebrated on 4 October every year, World Animal Day is an international day of action for animal rights and welfare. With a mission to raise the status of animals in order to improve welfare standards around the globe, this annual celebration which dates back to 1925 unites the international animal welfare movement, mobilising it into a global force to make the world a better place for all animals. To coincide with World Animal Day, Sunway Lagoon’s Wildlife Park – an interactive and educational zoo featuring more than 150 species-specific exhibits of exotic animals and a diverse range of birds, fish, reptiles and mammals from around the world – held a special campaign to promote its initiatives towards sustainability. Indeed, Sunway Lagoon’s wildlife park is unique in itself and has been long hailed amongst the animal welfare fraternity and families as a must-visit destination. The interactive concept behind the attraction encourages visitors to not only learn about the animals but to get up close and personal with these “friends”. In recent times, the Wildlife Park at Sunway Lagoon has stepped up efforts towards being more sustainable. Among these, Sunway Lagoon announced its support towards two of the Sustainable Development Goals (SDG) set by the United Nations. The SDG programme contains a total of 17 goals which the United Nations aims to achieve by the year 2030. It is a universal call to action, in a bid to end poverty, protect the planet and to ensure that all people can enjoy the diverse richness which Mother Nature exudes. Of these 17 goals, Sunway Lagoon’s Wildlife Park has, without equivocation, committed towards supporting two of these goals. These include Responsible Consumption and Production (Goal #12), aimed at ensuring sustainable consumption and production patterns and Life on Land (Goal #15), which aims to protect, restore and promote sustainable use of terrestrial ecosystems, sustainably manage forests, combat desertification, and halt and reverse land degradation and halt biodiversity loss. “With Sunway Lagoon being Asia’s premier theme park, we realise that our operations and undertakings leave a significant impact in the community. We therefore see it as our responsibility to make this impact a positive one. Especially with an attraction like the Wildlife Park, which is one of our most famous, it is essential to conduct our efforts and initiatives in a responsible and sustainable manner,” said Sean Choo, General Manager of Sunway Lagoon. “This is why we have pledged to support the two Sustainable Development Goals, which are highly pertinent to our operations. This, we hope, will further cement our commitment towards acting in an environmentally friendly and sustainable manner, even as we celebrate World Animal Day,” Sean added. 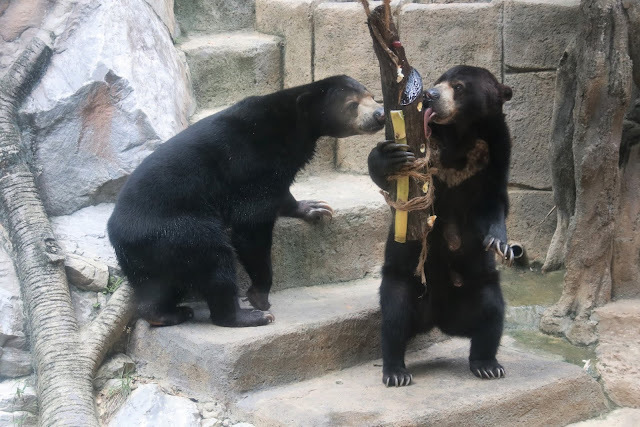 The World Animal Day celebrations at Sunway Lagoon’s Wildlife Park also took on an exciting yet heartwarming turn this year, when the park announced the arrival of its latest ‘resident’ – a new sun bear cub. 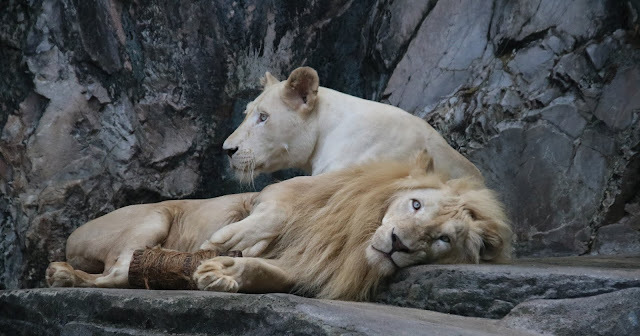 Sunway Lagoon will also be presenting one of the most unique and wildest dining experiences at its Wildlife Park together with some of its animals, which include its White Lions, Black Panther and White-handed Gibbons. Guests were specially invited to Sunway Lagoon Wildlife Park’s World Animal Day celebrations. Wildlife enthusiasts, both young and old enjoyed a host of activities and initiatives specially curated to mark this meaningful celebration. These included a special appearance by the sun bear cub, a display by the Department of Wildlife and National Parks (PERHILITAN), a multi-animal show, a contest to name the new sun bear cub, a scavenger hunt aptly titled WAD-a-quest and a Save the Earth Pledge Wall, where visitors can mark their pledge towards protecting and preserving Mother Nature. “For World Animal Day this year, we wanted to create an experience where people of all ages can enjoy Sunway Lagoon Wildlife Park, while learning more about how they can play a role in protecting our environment. All this ties in with our commitment to be more responsible and sustainable, yet presenting a unique and exciting opportunity for the public to enjoy, especially the younger ones, because they are the future of our planet, and will take on the baton towards environmental conservation,” said Sean Choo, General Manager of Sunway Lagoon. Students from Sunway International School (SIS) got to have a sneak peek into the fun and excitement that awaits visitors at Sunway Lagoon’s Wildlife Park’s World Animal Day celebrations when the park held a special Wildlife Encounter event at the school’s parking lot on 3 October. Graced by Her Excellency Julia Bentley, the Canadian High Commissioner in Malaysia, activities at the day-long event included appearances by some of the animals at Sunway Lagoon Wildlife Park, which students had the opportunity to feed and pet; a talk by Sunway Lagoon Wildlife Park Rangers and a quiz and prize giveaway. Students also had the opportunity to participate in the contest to name the Wildlife Park’s new sun bear, and sign the Pledge Wall, which was also set up in the school compound. Students also received discount vouchers, which were redeemable towards Sunway Lagoon’s entrance fee.